A fundamental lesson we have learned or relearned from the Greek crisis is that public opinion in itself is of little consequence and that any attempt to derail and undo existing modalities and articulations of political power need to disrupt the routines and activities that are constitutive of such power. 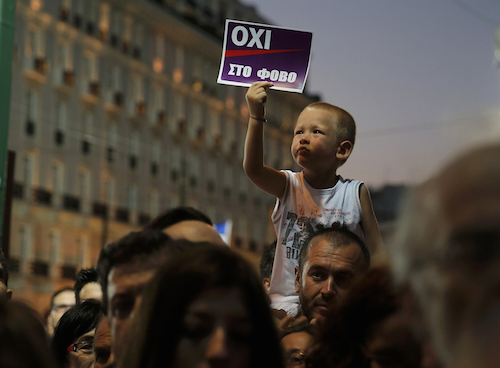 It would appear that for much of Syriza as well as its left supporters and critics the assumption was that people expressing their desires and preferences through protests and demonstrations or, more recently, referendums, constitutes a generation of political power. For example, many left activists have been concerned with the so called demobilization of ‘the movements’ since Syriza was elected; meaning that strikes and public demonstrations waned greatly since the Syriza government came to power. ‘Movements’ in this case, as is obvious, refers to the capacity to mobilize for the purpose of demonstrations and protests. Similarly, many thought that the results of the recent referendum would be a great boost to the power of Syriza and the bargaining position of Greece vis-à-vis its creditors. We have learned in recent times, however, that the expression of political preference or opinion in the form of protests and strikes (or even in terms of how one votes in elections or referenda) has little, if any, consequence. Recent times are replete with examples of this insufficiency of protest and resistance, but perhaps mostly tellingly for us here we have the recent history of Greece where 30 plus general strikes and many more demonstrations not only did not derail austerity but failed to even slow it down by one day. This is a testament to how extremely limited these forms of action are when it comes to impacting political power even in Greece, which is certainly not a worst case scenario compared to other capitalist states, and this also underlies how rigid and inflexible the institutions of state power have increasingly become. It is not true, of course, that the popular classes are irrelevant or inconsequential but that their agency is to be found elsewhere, notably in their social activity; the materiality of their social existence is much more significant than the fleeting expression of opinions. As Nietzsche pointed out long ago, “public opinion – private laziness”. Let me remind you of Vaclav Havel’s well known essay from his days as a dissident, “The Power of the Powerless”. There he astutely points out that despite the widespread dissatisfaction and disagreement with the regime in Czechoslovakia it was able to govern quite securely and reproduce itself without much difficulty precisely because where the Czech citizens did have agency, in their everyday routines and actions, they, out of habit, repetition, and self-interest functioned as sinews of state power; from decorating shop windows for national holidays, voting, showing up dutifully for work, pay one’s taxes, and so on, people actively produced and reproduced the power and legitimacy of the state. In a similar way we could argue that a key, but not the only, reason that the many demonstrations and general strikes in Greece have proven to be insufficient for transforming power relations is precisely because they have not disturbed the everyday practices through which state power is generated. 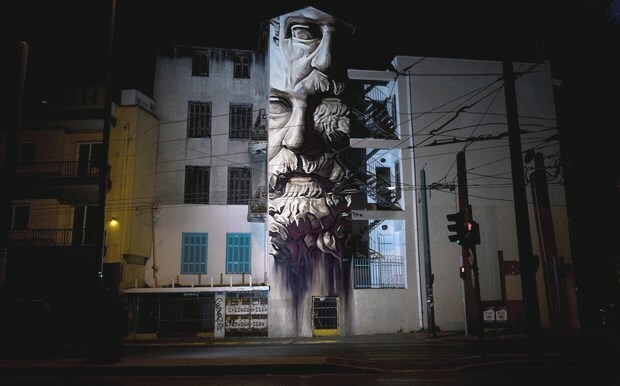 24 hour strikes and demonstrations of various scales and intensities may have been quite effective as expressions of how much people disagreed with austerity but they where of no consequence in either disrupting or transforming the everyday routines and rhythms of life in Greece. There is no doubt that the vast majority of Greeks were and are opposed to the many austerity measures adopted in the last five years. So what? To the degree that their daily routines and activities stayed constant, the production of political power continued unabated and the Greek state was able to implement austerity with little difficulty. The minds and will of the Greeks may have been opposed to austerity but their bodies were fully in support. Thus a fundamental lesson we have learned or relearned from the Greek crisis is that public opinion in itself is of little consequence and that any attempt to derail and undo existing modalities and articulations of political power need to disrupt the routines and activities that are constitutive of such power. Such was the effect of May ’68 in bringing the French state to its knees and such is the explicit threat by the European Union that by closing the Greek banks the Greek state could and has also been brought to its knees just as quickly. It is here that I would like to turn to Nicos Poulantzas and Henri Lefebvre. If the generation of political power can be derailed by suspending the routines and repetitions of daily life, an even more important and difficult question is how one can produce a new power that supersedes the old. Once we destroy the existing political order how can we replace it with the new? With Poulantzas and Lefebvre we find two guiding principles for such a project of change. 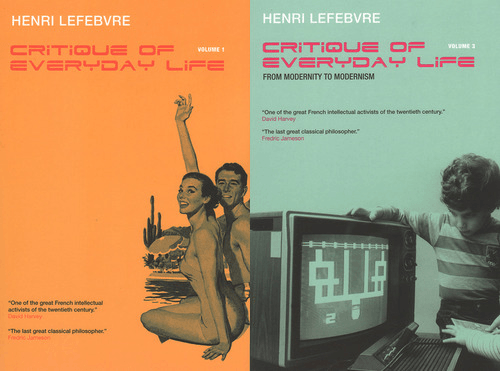 Firstly with Lefebvre we find the raising of the everyday to the most fundamental and concrete level of social existence. For him everyday life is the social level that is lived and where all change is manifest. Put simply everyday life is everything and there is no political transformation if it is not a transformation of the everyday.As such, any and all lofty intentions of what it is we desire (a furthering of democracy or human emancipation for example) can only be realized as a transformation of everyday life. Questions of architecture and urban design, the school and working day, and food and sexuality, to give just a few obvious examples, are not secondary or tertiary issues but primacy ones that are at the heart of our social existence and from which the more abstract and presumably grander institutions of society emerge. There is not enough space here to go into much detail about what such changes could be but the point is that at the heart of our struggle and efforts we need to be we need to be working on these questions and actively engaged in remaking our own world. Rather than give the answer of Samuel Gompers, that ‘more’ is what we want, we need to think about and act on remaking our daily lives rather than blindly engage in repetition. Poulantzas’s understanding of the state dovetails very nicely with this position when he defines state as a social relation and its institutions as condensations of class struggle. This not only means that the state is created by and through daily practices and struggles as already noted, it also underlies the fact that political institutions are one of the ways that past struggles live on and exert their influence on the present. If capital, following Marx in the Gundrisse, is dead labor then the state is dead struggle. As such, any efforts to transform our societies must deal with this weight of the past on the present and have as a strategic goal to transform the institutions and apparatuses of the state. The struggle inside and outside the state needs to always include reconstituting state institutions so as to be more favorable to the substantive outcomes that we desire. For example, if the ever increasing bureaucratization and centralization of the state is a key limit in the political agency of the popular classes, a key goal for Syriza needs to be to focus the struggle on transforming these state institutions. Instituting popular assemblies to replace municipal authorities, as one possibility, or, at a minimum, establishing a new constitutional assembly to begin thinking about how to replace the existing one. Unfortunately, instead of intense discussions on the foregoing what we find in Greece today, in the best-case scenario, is dedication to combat corruption and eliminate clientelism rather than dedication to remaking the Greek state. In other words, rather than being critical of the state-form as such and thinking of ways that we could try to reconstitute Greece, we are stuck in the liberal fantasy that an objective and impersonal organization of state authority would, finally, provide the conditions for prosperity and justice. Any party that has named its think-tank after Nicos Poulantzas should know better than that. To conclude, at this very moment of flux and uncertainty when so much is possible, when a radical left party is able to win elections in Greece, when everyone’s focus is on VAT rates and bond spreads, when the bulk of Greeks have been momentarily roused from their petit-bourgeois slumber, we have the opportunity to make fundamental changes in the rhythms of daily life as well as the constituent institutions of the Greek state. If it is indeed the case what we have reached a point in where we cannot continue as we were, we need to be agents in this process of transformation and not spectators and victims. It is not too late to extend our efforts, to progress from the attempt to rein in austerity and bring some measure of economic security and hope to the attempt to reconstitute Greek society. Such moments of historical possibility are few are far between, rather than squander it out of fear and economistic tendencies, a Syriza with a clear politico-ethical project is needed that places political life above biological life, that understands the deepening of democracy in our daily lives as the only measure of success and efficacy. * Peter Bratsis is an Assistant Professor of Political Science, Social Sciences, Human Services & Criminal Justice at the City University of New York. ** The First World Conference on the subject “Democracy Rising: From Insurrections to ‘Event’” was organised by the Global Center for Advanced Studies (GCAS).